Spider released the ILD02 and 2SGS remote-controlled zero-turn mowers and demoed 3RIDER, a driver- and remote-controlled mower at GIE+EXPO. Dvorak, the Czech Republic-based manufacturer of the Spider range of remote-controlled slope mowers, has released the Spider ILD02, with a 4-foot cutting width and ability to climb slopes up to 55 degrees. The ILD02 includes a patented drive system, known as the Dance Step, in which four-wheel drive and four-wheel steering allow the mower to move and mow forward, sideways and backwards with unlimited continuous 360-degree turning of all wheels. This provides maneuverability in all types of terrain, climbing ability and gentle treatment of the turf, even in wet or soft conditions, said the company. 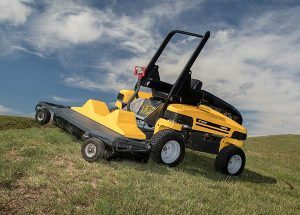 The ability to control the mower remotely allows the operator to stay away from the working area when mowing on hillsides and in dangerous areas. The drive system allows the mowers to work on extremely steep slopes with an incline up to 40 degrees. The integrated hydraulic winch then increases the climbing ability to 55 degrees. 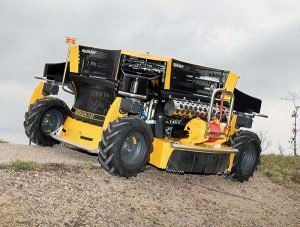 The Spider ILD02 weighs 809 pounds, is powered by a 24-hp Kawasaki gas engine and is also equipped with a skid-steering system to allow the mower to turn around its vertical axis. This simplifies handling, especially when loading or unloading on transport vehicles or trailers, according to Spider. The ILD02 has a top speed of 5 mph and is capable of mowing, on average, 1.73 acres an hour with a fuel consumption of 0.95 gallons per hour. The Spider ILD02 can replace up to 14 operators with brush cutters over a season while maintaining a consistency of cut, according to the company. 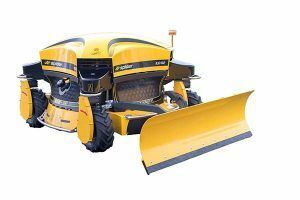 The standard cutting height range is 3.5 to 5.5 inches with an optional lower height of a cut of 2.8 to 4.7 inches, all controllable from the operator’s remote-control unit. A 55-inch wide snow blade can now be easily attached to the front of the machine for use in the winter months. The remote-control unit is ergonomic, intuitive and easy to use, allowing the operator to control the machine from a safe distance. Speed, direction, height of cut and safety cutout are all controlled from the unit. The Spider 2SGS is a remote-controlled mower specially designed for maintaining turf areas around photovoltaic (PV) panels on solar farms. Adapted from the Spider ILD02 slope mower, the Spider 2SGS features upgraded hydraulic motors and a lower profile for maintaining the turf beneath and around PV panels. New rubber fenders have been added to reduce any impact damage to the framework supporting the panels. Shading can have a huge impact on the performance of solar photovoltaic panels, which consist of numerous solar photovoltaic cells wired together into a series circuit. If even a small section of a solar photovoltaic panel is in shade, the performance of the whole photovoltaic panel will significantly reduce, explains Bristow. Dvorak previewed its advanced prototype, the Spider 3RIDER, at GIE+EXPO in October. The 3RIDER can be operated by a seated driver on slopes of up to 15 degrees and then, when the slope becomes too extreme, the operator can demount from the mower and continue to control it by remote control from a safe position away from the machine. The 3RIDER uses a 24.9-hp Kubota diesel engine, which allows for the machine to cut 2.4 acres an hour. The axles are independently attached to the main frame, allowing the mower to articulate on uneven terrain. The operator’s seat is centrally located, and the front mowing deck is attached to the main frame at the midpoint and kept on the terrain by a torsion bar, which provides the operator with the best possible 360-degree view and allows the mowing deck to float, following the contours of the terrain. The front-mounted 5-foot, 3-inch (1.6 meter) deck uses seven small high-speed rotary motors. The front row of four blades rotates in one direction, while the rear bank of three rotates in the other direction. Changing to the mulching option is simple and quick, according to Spider. The standard blades are replaced with mulching blades, and a switch on one of the drive motors is activated so that in mulching mode, all blades rotate in the same direction.